The elephant is the largest animal that lives on land. They have tusks made from ivory and are the only animal to have a nose in the form of a trunk that they usa as a hand. There are two kinds of elephants, African elephants and Indian elephants, also known as Asian elephants. Wild elephants usually eat for about 16 hours a day. Their diet includes grass, leaves, roots, bark, branches, fruits and shrubs. 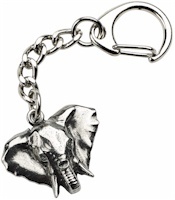 This elephant is made from pewter an is supplied on a quality key-chain.